Thank you to those who asked why so long without another edition of the Woggle - my fault entirely. Hopefully 2011 will see a return to our normal monthly edition. I do hope that you have kept up to date with all of our news through our website and reports in the Hayling Islander and Hayling Trader. Chief Scout's Recommendation for Meritorious Conduct. In July 2010, Barnabas Pycroft, Mike Kenny and Jake Whistlecraft were involved with the rescue of a person who had collapsed on the mud flats near the Billy Trail. A full report was contained in the August edition of the Hayling Islander. As a result of reporting the event to Scouting HQ, it was brilliant to hear that Bear Grylls, our Chief Scout, had considered their action worthy of formal recognition with the presentation of the "Chief's Scout Commendation for Meritorious Conduct". 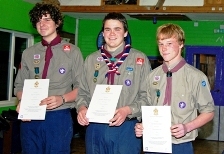 The awards were presented by Adam Jollans, the County Commissioner for Hampshire Scouting, and the photograph shows the Explorers with their certificates and medals. In my 40 years as an adult Leader with Scouting, this is the first time I have known the recipients of this prestigious recognition. Advanced notice that this year we will be holding a Group Camp between Friday June 24th and Sunday June 26th. Cubs, Scouts and Explorers will be camping for the whole weekend and the Beavers are invited to join us for the Saturday and Sunday, but not sleeping over. More details will be sent out in February but please put the dates in your diaries. 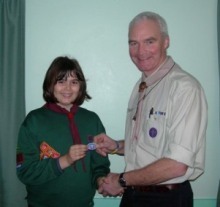 Congratulations to Sian Howell who received her Chief Scout's Gold Award recently. In addition to completing a number of badges, for her personal challenge she took on the responsibility to organise a night exercise for the troop. Well done Sian and I am sure your achievement will motivate others. Although the last draw for this year's 100 Club is not until March 2011, we will shortly be sending out the details for 2011 / 2012. We hope to continue with our 100 Club and ask for your support. The annual cost is £24 with the chance to win one of the 41 prizes ranging from £25 to £100. Thank you to everyone who helped us with the delivery of Xmas cards. Over 5000 were delivered bringing a welcome profit of £1000 which is being shared between our transport fund and subsidising activities at our Group Camp in June this year. 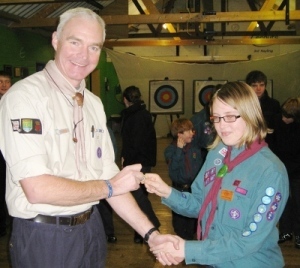 In December 2010, Nina Watson of Mars Pack was presented with her Chief Scout's Silver Award by Ian Stott the District Commissioner. For her personal challenge Nina, aged 10, prepared, cooked and cleared away 6 different meals for her family. Well done, Nina. Our two book sales in 2010 achieved a new record profit. In total the two sales raised over £1800 with the November sale reaching £950 - the highest ever we have achieved from a single sale. Well done and thanks to Phil and the team. This does of course bring a new challenge for 2011! Congratulations to Nigel Kenny on receiving his 5 year Service Award. Nigel is a member of our Group Development team and also the Badge Secretary for Hayling Scouts and Havant District. Phil Blosse our Chairman was presented with his 30 year Service Award all of which has been in support of the Hayling Scouts. - now for the 40 year one! 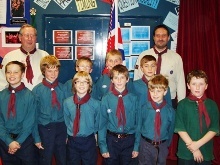 In November we opened our 4th Scout Troop, under the leadership of Dominic Howell and Tony Baker. Scorpion's started with 9 Scouts. shown below, but is now standing at 12 with more new members to come this term. There may have been snow and the temperatures low but this did not stop Dreadnought, Eagle Troop and Gannet patrol from Shark Troop camping - although the Gas did freeze over one night! This is what the "out" in Scouting is all about! The Famous 5 tame Exmoor. The famous five - well nearly famous - completed their 5 day expedition in wild country as part of their Queen Scout's Award and Duke of Edinburgh Gold Award recently. During their 5 days on Exmoor, Jordan Reed, Abi Peett, Zack Allgood, Liam Holden and Ed Harrison experienced temperatures ranging between -3 and +17 degrees centigrade. This demanding challenge not only tests their stamina and map reading in wild country but also their team work and commitment. James Taylor and William Lintott were invested next to the Skittles Alley at the Royal British Legion on Hayling Island. The Cubs of Saturn Pack were holding their end of term Christmas Event with a skittles evening and it seemed to be a great chance to hold the investiture ceremony in an unusual place. Other users of the RBL may have wondered what was going on when the Cubs started their meeting with their Grand Howl!! The photograph shows the Cubs of Saturn Pack, before the skittles tournament with James and William taking centre position. 40 Beavers from Aspen and Redwood Colonies joined others from across Hampshire for a fun day at Paultons Park. The highlight of the day was the chance to visit Santa in his grotto and of course receive a present.